Der Pumpkin Kopfstützen DVD-Player 10,1-Zoll kam gut verpackt und super schnell bei mir an. Die Qualität und Verarbeitung ist sehr gut, die Bilder sind spitze genauso wie die Tonqualität, wenn man zwei gleiche Monitore kauft kann man die auch unternander verbinden und somit den selben Film oder das gleiche Spiel angucken und spielen, einzeln kann man ihn, wenn man sich ein passendes Netzkabel zulegt, den DVD-Monitor auch zuhause nutzten. Der DVD-Player kann unten über das Touchfeld gesteuert werden. Die Qualität von allem Fernbedienung und Player ist wirklich einwandfrei! DIESES MODELL hat einen HDMI Anschluss. Wir gehen von der Videoseite: Der Player unterstützt DVD/ VCD/ MP4/ RMVB/ CD-R/ CD-RW/ SVCD/ DIVX: praktisch alle verfügbaren Videoformate. Sehr gutes Set für ein perfektes Filmvergnügen im Auto. Einfach an den Kopfstützen befestigen und mit dem Auto-Zigaretten-Anzünder verbinden,fertig. Ob DVD,VCD,Mp4,RMBV,CD-R,CD-RW,DIVX,SVCD sowie SD Karte Oder 2.0 USB Port für den kleinen Alleskönner kein Problem. Ton und Bildqualität finde ich persönlich überraschend gut. On a quest to find a portable media player for my kids that I could use in my vehicle, I finally stumbled across this outstanding product. After purchasing 2 other portable media players, and both being defective, and having to be returned, I discovered the Pumpkin, 10.1 inch digital media screen. The first thing that stood out was the brilliantly designed adapter bracket used to attach the media player to the headrest. 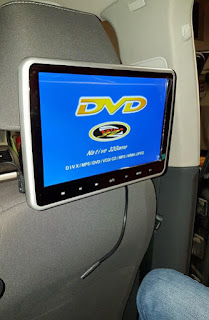 Unlike the cheap straps that the other media players used, this design, included an adapter bracket, that easily snapped onto the headrest posts and did not obstruct the actual headrest for the front seat passenger or driver. The screen then easily attached to the adapter bracket, providing a clean look. I also liked how easily it could be removed and reattached to the bracket in event the screen needed to be taken out for any reason. It also allowed the ability to vertically tilt the screen for optimal viewing. When I turned the media player on the first thing that stood out was the screen quality. Not only was the screen slightly larger (10.1 inches vs 9 inches or 7 inches) and flatter than most other portable players, the resolution and visual quality was outstanding. I liked how quickly a dvd disc booted up as well. There was no long waiting for it to read the disc, nor did it have any trouble reading a disc. Also another great aspect to this player was despite visible vibrations when attached to my seat and driving down the road, the disc never skipped once. Though I have not been able to experiment with all the features of this player, what stood out was the number of available options. After thorough research, I could not find a portable media player that included all the features that this one did. I won’t list them all, but the features that this player included that stood out most to me, were the HDMI input, media card reader, the resume playback feature, and the remote control. Most players priced in this range exclude most of these features that I listed. Though not applicable to me at this time, this player included other great features like FM sound modulation, IR headphone support, AV ins and outs, and even included a video game disc with the remote doubling up as a controller! In conclusion, I would rate the Pumpkin 10.1 inch portable headrest monitor media player five out of five stars. You simply will not find a better quality product, with more features, and in this price range. My only criticism of this product is that the unit’s built in loudspeakers are not loud enough, even when the volume is maxed out. I only mention this because my child is too young to want to use headphones and rather than play the audio through my vehicles speakers, I like to listen to native audio sources in the front of my vehicle while my child is watching a movie in the back. Between my native audio signal and road and wind noise, the speakers on this player were not quite loud enough. That is a minor gripe that will change when my child is older and will prefer to use headphones. Finally, this product is such an outstanding value, that I will be purchasing a second unit for my youngest child, once they are old enough to utilize it, in about a year. First of all I want to Thank Pumpkin Customer service. They are really helpful, I had some problem with my order and they have helped me very fast. Thank You! Screen quality is very good, touch screen – very responsive and picture quality – amazing. Just what I wanted! 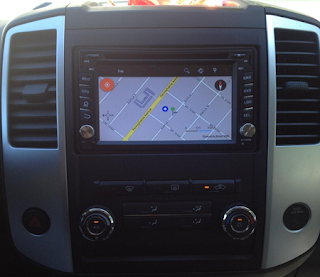 This is my second Android car stereo in my car. I have two Android units in my car – one Pumpkin double din and another custom made Nexus tablet, one for navigation and another for entertainment. Quality for the price is very good. Everything works as it should, as my oem radio. When you will start car it will continue to play track, or will jump to same radio station or any app you have used, before you have switched ignition off. Navigation also works very good. I have downloaded google maps offline maps. And also GPS signal is very good, even with GPS antenna hided under dash. -Screen feels a bit plastic. – glass screen would make this model more premium – also to look and feel more expensive. -Better integrated EQ – easy fix is to download better from Play store. -MORE Launcher THEMES – also there many launcher apps in Play store, but not many people know how to install them. I have managed to fully fit this unit in my Avensis in 1 hour, but I still have some problems with fascia. I have to make some modifications to make it look nicer. Unit came with all necessary cables, exactly same as you can see in product page pictures. I have bought Steering Stalk Control for my car to connect steering wheel controls to Pumpkin stereo. And everything works perfect. You can also set function for every steering wheel button individually in settings. -APP resume when you start car. -Screen brightness changes when you switch light on/off. -You can set time after how many minutes unit to shut down after ignition switched off. -Bluetooth hands free calls – It connects automatically when your phone is in range. Call quality is very good even without external mic. You can change to auto answer calls in settings. -Easy change button LED light colors to match other interior buttons.